As a home or business owner, your garage door is your first and best line of defense against the outside world. Unfortunately, it isn’t always able to withstand the ravages of weather, human meddling or other calamities, and these disasters don’t strike according to a schedule. 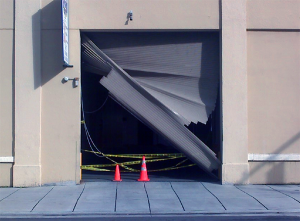 When unforeseeable events compromise your property’s security and functionality, it’s time to call Door Aid’s legendary 24hr garage door repair team at 778-650-0400. What’s at Stake With Garage Door Repair? You can’t afford to wait for your garage doors repair. Even if the damage isn’t highly noticeable, every second that your doors spend in poor condition is another second that your home spends compromised. Some deficiencies even lead to costly building material degradation. Whether it’s a door that can be jimmied open or a closure mechanism that fails to function properly, contacting a Door Aid expert is always the first step. You may not require immediate garage door repairs, but that doesn’t mean time isn’t of the essence. Our local garage door repair experts can get to your Vancouver property faster, which means that you spend less time vulnerable to threats. The fact that we’re local also means that our work is more dependable. We stake our reputation on the jobs we do in the Vancouver area, so we devote special care to ensuring that they’re of the highest quality. Whether you realize it or not, you’ve probably seen our amazing work around town. Our results are exemplary of the attention to detail and dedication to quality that we apply to every job we perform regardless how urgent it may be. Stop putting your garage doors repair on hold or waiting to find the right service. Instead, place your faith in Door Aid. No matter how disastrous your emergency was, our 24hr garage door repair teams can help your life regain a sense of normalcy.